I’ve got a cake for my dad baking in the oven. In the mean time I thought I would share a classic Montreal breakfast. 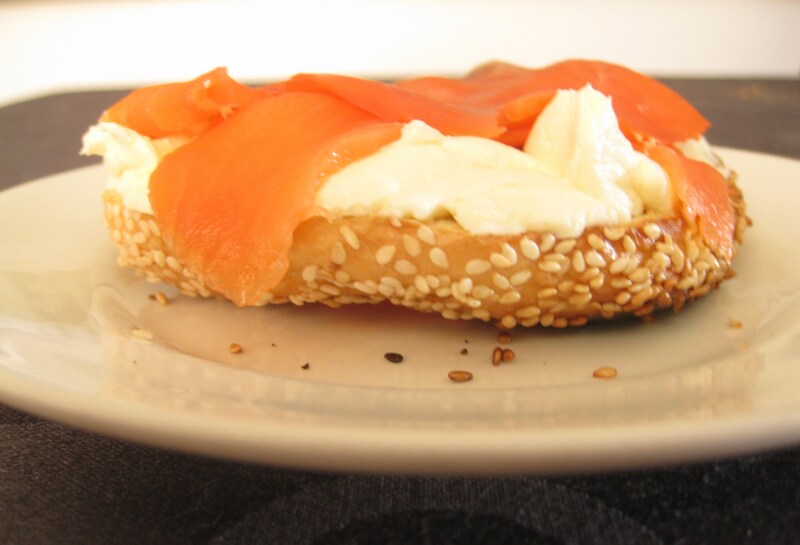 A Fairmount bagel with cream cheese and smoked salmon. Fairmount and St Viateur both make their bagels fresh all day, every day. I won’t get into a discussion on which is better, as they are both excellent, nor will get into a discussion on Montreal vs New York bagels because that might lead to some serious arguments. All I will say is that Montreal bagels are smaller, denser, sweeter and baked in a wood fire oven which gives them a great flavour. Yum! My grandfather is going fishing in Alaska next week and I cannot wait for him to bring back fresh salmon for breakfasts like this one. Wow, awesome blog lauyot! How long have you been blogging for? you make blogging look easy. The overall look of your website is fantastic, as well as the content!. Thanks For Your article about Travelling to Canada? HotelsVsHomes has Amazing Options! | HotelsVsHomes . A delicious breakfast. I love smoked salmon and cream cheese together.